Texts by Catharina Gabrielsson, Stefan Jonsson, Marie Kraft, Doreen Massey, Jonathan Metzger and Emma Stenström, among others. Ed. Ann Magnusson (The Culture Administration within the Stockholm County Council, 2010). 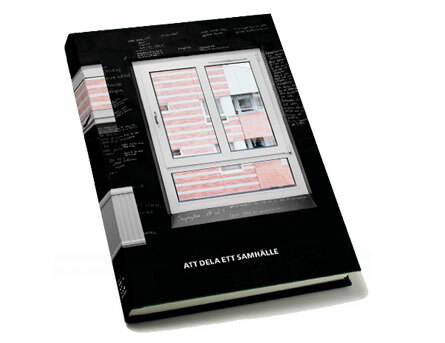 "Att dela ett samhälle" [Sharing/Dividing a Society] is the title of a 3-year art project as well as of this book. The book reports on the collaboration between four artists – Janna Holmstedt, Anna Högberg, Johan Tirén and Johan Waerndt – and the Stockholm Office of Regional Planning. Also included are reflections by a number of writers, offering a variety of approaches to art and regional planning. "Open engagement - Commissioning and Producing Art for the Public Realm", group exhibition and international symposium, Sep 25-Oct 11, 2009, Marabouparken annex, Sundbyberg. "Labyrinth 09 - Writings and Observations", Nov 7-Mar 13, 2010, Botkyrka konsthall. ”Att dela ett samhälle", exhibition, 28 Nov-9 Dec, 2009, Kulturhuset, Stockholm.